Click here to view the state testing results from previous years. Students in grades 3-8 and 11 will use computers and/or chromebooks to take the state assessments in English-language arts and mathematics. When will Lydiksen students be taking the SBAC tests? 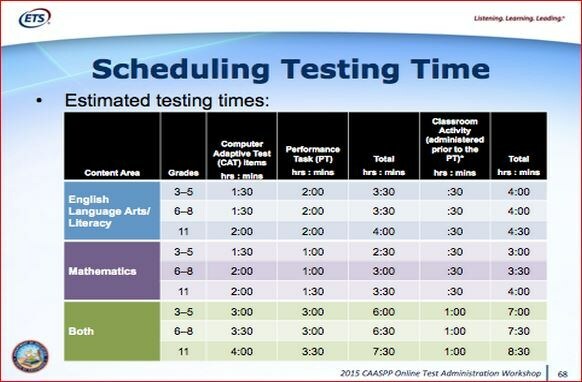 Students at Lydiksen will be taking tests throughout the dates of April 13-May 15. Please check with your child's teacher for specific dates. The PT is designed to provide students with an opportunity to demonstrate their ability to apply their knowledge and higher-order thinking skills to explore and analyze a complex, real-world scenario. Prior to the PT, teachers or instructional staff conduct a Classroom Activity for all students to ensure that a lack of understanding of the context of the task does not interfere with a student’s ability to address the content of the task. This is the first year that public schools are being held accountable for fully implementing the Common Core Standards in English-language arts and mathematics—and the first time that scores from tests aligned to those standards will be reported. Over the past few years, educators have been working to develop knowledge, skills, and new teaching repertories to support the standards. Questions that require abstract thinking, synthesis, and analysis will comprise 50-60% of the new state assessments. This is a dramatic increase in rigor over past state assessments. In short, we are expecting students to think and process information differently than in the past. Based on projections from the 2014 Smarter Balanced field tests conducted in California and 21 other states, it is likely that fewer students will score at the higher achievement levels on the new assessments, especially in the first few years. However, a drop in test scores doesn’t mean students are sliding backwards or learning less. Rather, it gives us a more accurate measure of where students are on the path to success based on expectations that are designed to prepare them to compete nationally and globally. Educators and parents should see the results as a new start. The California Assessment of Student Performance and Progress (CAASPP) Smarter Balanced Assessment Consortium (SBAC) has replaced the Standardized Testing and Reporting (STAR) California Standards Test (CST) Program as the new state academic testing program. It is important to note that these scores cannot be compared to scores that your child previously received on the STAR Program tests because this test is based on the new Common Core State Standards, involves different types of test questions, and will not be reported using the STAR Program reporting categories. Parents, teachers, and schools will receive reports from the new tests in late spring, with student data reported in two significant ways. In order to comply with the federally required No Child Left Behind Act, California is required to provide both scale score results and achievement levels for students. These results should be looked at in context with other metrics—including local district assessments, report card grades, and portfolios of student work—to determine how well students are learning. With the Common Core Standards for English-language arts and mathematics, learning activities are organized and sequenced from grade to grade to build understanding for students. Success with standards at each grade level ensures that students are ready for the next grade, ultimately leading to readiness for college and careers. Smarter Balanced assessments are one tool that schools can use to gauge student learning relative to the Common Core Standards. Each question on the new assessments is focused on one or more claims related to a student’s understanding of English language arts or mathematics. Students can engage in research and inquiry to investigate topics, and to analyze, integrate, and present information. In addition, the reports will provide an overall score for student progress in English Language Arts and mathematics. This overall score will indicate the student’s level of understanding in each content area.